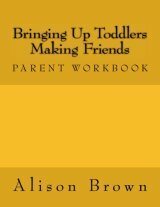 Bringing Up Toddlers - "Parent Workbook"
As the first parent workbook in the BRINGING UP TODDLERS series, "Making Friends and Social Skills" addresses four key elements aimed to help parents understand the developmental stages through which their toddler will move. Incorporating typical scenarios, parent input, tip sheets and visual prompts, this workbook provides an opportunity to reflect on the realities of bringing up toddlers. Each section provides parents with opportunities to record their child's journey, together with outlines of realistic expectations, and strategies to coach and support their toddlers in the development of positive and appropriate friendships and social skills.